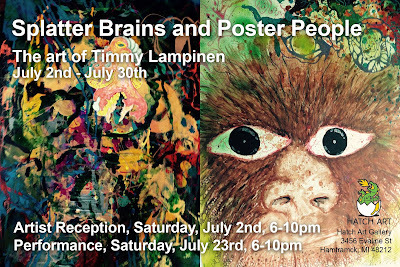 Hatch Art is pleased to announce the retrospective exhibition "Splatter Brains and Poster People", artwork from Timmy Lampinen's past and present. This show will include new, current and past artworks by Timmy, including poster art from past performances. Please join Hatch Art for the opening reception on Saturday, July 2nd from 6-10pm. Here is some of my work through out the years! New and old! From paintings to poster art. I am a mixed up dude using mixed up media. My brain is scrambled, there for I SPLATTER paint etc., onto whatever I can find! From wood to cardboard to store bought canvas. I do not color in the lines in any aspect of my life. Never mind the Pollocks, here’s Timmy Vulgar!!! Timmy Lampinen aka Timmy Vulgar Has been a creative force for the last 20 years, in Detroit and around the world. Playing in many bands and booking shows and making all his own poster and album art. Timmy's bands include EPILEPTIX, CLONE DEFECTS, HUMAN EYE and Currently TIMMY'S ORGANISM! He's also a Taco chef on the side and a 2010 Kresge Arts in Detroit Fellowship awardee. As Timmy's music strives for wild abandon and maximum impact via spaced-out sounds, his artwork opens your third eye and squeezes in a couple more.